Buy Books Online > Impact of science & technology on society > In Our Own Image: Will Artificial Intelligence Save or Destroy Us? 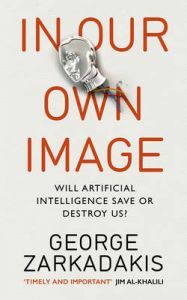 In Our Own Image by Dr George Zarkadakis explores one of humankind's oldest love-hate relationships - our ties with Artificial Intelligence or AI. Zarkadakis traces AI's origins in ancient myth, through literary classics such as Frankenstein, to today's sci-fi blockbusters, arguing that a fascination with AI is hardwired into the human psyche. He explains AI's history, technology and potential; its manifestations in intelligent machines; its connections to neurology and consciousness, as well as - perhaps most tellingly - what AI reveals about us as human beings. In Our Own Image argues that we are on the brink of a fourth industrial revolution - poised to enter the age of Artificial Intelligence as science fiction becomes science fact. Ultimately, Zarkadakis observes, the fate of AI has profound implications for the future of science and humanity itself. George Zarkadakis is a well-connected science writer, playwright and novelist with a PhD in Artificial Intelligence. He has worked for organisations including the European Commission and the British Council, Silicon Graphicsand the European Bioinformatics Institute; appeared on the History Channel; written for publications such as Aeon digital magazine and the Washington Post; and been knighted by the French government for his services to science communication.